Dr. Lau-Deza received her medical degree from Universidad Peruana Cayetano Heredia and completed her residency in Internal Medicine at the Georgetown University/Washington Hospital Center in Washington DC. Subsequently, she completed her fellowship in Pulmonary and Critical Care Medicine at the Albert Einstein Medical Center in Philadelphia, PA. She is board certified in Internal Medicine, Pulmonary Diseases and Critical Care Medicine. 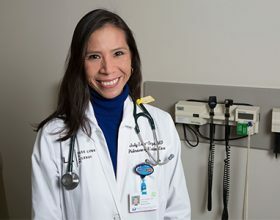 Dr. Lau-Deza is fluent in Spanish and her areas of interest include Pulmonary Infections, Interstitial Lung Diseases, Critical Care Medicine as well as Asthma and COPD.